NEW DELHI: The Dalai Lama has said New Zealand Prime Minister Jacinda Ardern is "wonderful" and "a living example" of compassion. Addressing a press conference here on Thursday, he praised the way Ardern handled the shooting incident at Christchurch. 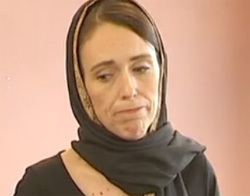 Fifty people were killed in a terror attack on two mosques in Christchurch last month by a White Supremacist extremist. Ardern's humane approach in the aftermath of the violence like the way she consoled the grieving families had received worldwide applause. Following the shooting incident, the Dalai Lama had also expressed his deep sadness through a letter last month to the New Zealand Prime Minister. He wrote, “I applaud the way you and the people of New Zealand have reached out with compassion and support to members of the Muslim community among you. It is encouraging too that across the world, people of all faiths are visiting mosques in solidarity with Muslims after the Christchurch shootings. “Your Government's determination to reform gun laws will contribute to peace and security, but equally important is to resist hatred and fear by cultivating warm-heartedness as you have shown,” His Holiness said in his letter. Meanwhile, on Friday morning local time in New Zealand, Brenton Tarrant, 28, the Australian accused of the shooting, appeared via video link in the Christchurch High Court. He was formally charged. Tarrant appeared on screen, handcuffed. He looked relaxed. The court ordered a mental health assessment as is the practice to determine the fitness for trial. He will appear next on June 14. Sobbing relatives of those killed had assembled in the court. Tarrant was arrested soon after the crime on March 15 and produced in the court the next day.